Maybe it’s too hot to run outside for much of the year where you live (Phoenix). Or perhaps winter starts too early and goes too late (Anchorage). Maybe it’s too hilly (San Francisco) or too flat (Indianapolis). Whatever the reason, you bought a treadmill. You want to exercise, regardless of the weather or terrain. But now you’ve stopped using your treadmill out of boredom. If you could use something to get you moving again, why not turn to your iPhone or iPad for something besides Netflix? The concept behind them is simple: a video of gorgeous scenery from around the world, shot from the point of view of an athlete in motion, appears on your iPad or iPhone screen while you work out on indoor exercise equipment. You’ll appreciate the videos more on an iPad because the bigger the screen, the easier it is to see the video. If you’re lucky enough to have a treadmill positioned in front of a big-screen TV with an Apple TV attached, you can use AirPlay to display the video, so you don’t have to run with your head down staring at the iPhone or iPad screen sitting on a shelf on your treadmill. Make sure you have a strong Wi-Fi signal to get the video from your iOS device to your Apple TV to reduce or eliminate any lag. Treadmill Trails — You can download Treadmill Trails along with a 30-minute sampler video from the app’s built-in Trail Store for free. Additional 30-minute videos — there are currently over 40 — cost $0.99 each, and offer free previews. Each trail video is about 900 MB in size, so it’ll take some time to download. To begin, tap the My Trails button within the app, tap the video you want to watch and start moving on your treadmill — video playback is smooth. As a bonus, you can also ride a stationary bike or use an elliptical machine. Each video includes music and narration, but you can opt for your own music if you prefer. Since each video is almost a gigabyte in size, you may have to manage your storage space carefully to keep a variety of videos on your device. The good news is that once you purchase a video, you can delete it from your device and re-download it as many times as you wish. One other major design factor to keep in mind: Treadmill Trails stores its videos in your Photos library. So if you have iCloud Photo Library turned on, each video will use up roughly a gigabyte of your iCloud storage space and could impact storage space on other devices too. Treadmill Trails has received some recent updates, but I’ve still run into bugs. Notably, using AirPlay doesn’t work correctly. The narration and music contained on the free sample video would not play at all using iOS 11 on my iPad Pro when I used AirPlay to send the video to my TV. In addition, if you AirPlay a Treadmill Trails video with your iPad in portrait orientation, the video appears in a landscape orientation on your TV (good) but will be heavily letterboxed (not good), leaving thick black bars on all four sides on the image, defeating the purpose of using the big-screen TV. And if you switch the iPad to landscape orientation, the mirrored video on the TV rotates to portrait orientation (bad), and the image itself rotates 90 degrees, making the video appear to be on its side (very bad). The developer promises a fix for this bug in a future version of Treadmill Trails, but this part of the app has been problematic for some time. That said, since the video is stored in your Photos library, you can open the video within Photos and AirPlay it from there. Much to my surprise, when I did so the video filled the TV screen sans letterboxing and the AWOL audio also worked. It’s an effective workaround, but it’s a bad sign when a developer’s content looks and works better in another app. BitGym — Unlike Treadmill Trails, BitGym operates using a subscription model, although it offer free 10-minute samples so you can try it out with your exercise equipment. For $7.99 a month, you can access as many of the over 100 high definition videos as you want. In addition to an option to download videos to a “vault” within the app, you can opt to stream videos to your device. That eliminates any worry about storage space, but you need a strong Wi-Fi signal and a healthy Internet download speed to avoid video stutters. Also, you’ll want a generous bandwidth cap. BitGym will prompt you to access your iOS device’s front-facing camera. Unlike Treadmill Trails, which has videos that play at a constant pace, BitGym uses the device’s camera to detect your cadence and adjust the speed of the video on the screen. The faster you move, the faster the video plays. If you stop, the video grinds to a halt. BitGym offers four different exercise machines to choose from (bike, treadmill, elliptical, and ergometer) before you begin your workout. The app also provides tours that are appropriate for the exercise machine you are using. For instance, on a treadmill, you’ll probably want to pick a video from the Mixed Tours group, which includes both trails and urban landscapes. If you’re riding an indoor bike, either a Road Tour video or Mixed Tour video is probably a better fit than a Trail Tour video. But if you want to use an ergometer on a mountain trail, have at it. 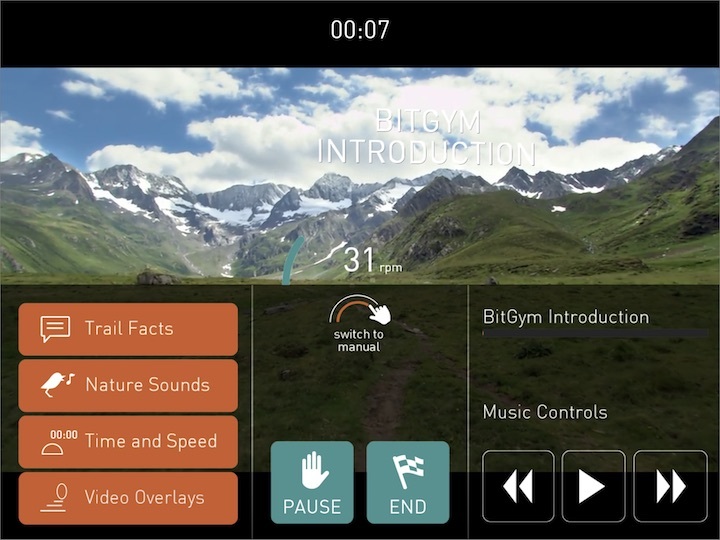 Once the video is underway, you can display various items on-screen (such as trail facts and your time and speed), and hear nature sounds, a coaching voiceover in selected videos, or your own music. Those with big-screen TVs can mirror the iOS screen to a television using either AirPlay or an HDMI adapter and cable. Unlike Treadmill Trails, AirPlay to an Apple TV worked fine. You can sign up for a free account, which can track some workout stats, and optionally upgrade to the subscription service later. The free account lets you access several different circuits with various locations — roads, nature, urban — and different coaching levels with 10-minute workout limits. Upgrading to the BitGym Premium subscription removes all the limits. Kinomap Fitness — Like BitGym, Kinomap Fitness relies on a $7.99 per month subscription and supports a variety of fitness machines — bikes, treadmills, ellipticals, and more. Unlike BitGym and Treadmill Trails, Kinomap Fitness attempts to make full use of your specific exercise equipment. It supports a number of exercise machines, and you can enter details about your own if it’s not included, communicating with it via Bluetooth. I wasn’t able to test this, but, according to Kinomap Fitness’s documentation, if you have an interactive fitness machine, its resistance or incline will change automatically to match the profile of the ground in the video. If you use an external sensor to detect stride, cadence, or speed, the app will signal you to modify the resistance manually. No external sensors? Kinomap Fitness can use the front-facing camera on your iPhone or iPad to detect your cadence, stride, or stroke. After launching the app for the first time, you’ll be prompted to create a free account, which gives you access to your videos and favorites. You can even upload your own videos. 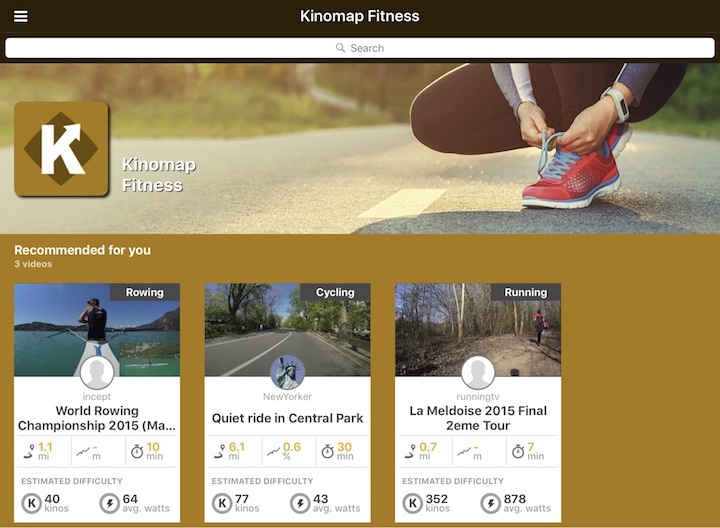 Happily, Kinomap Fitness makes a selection of running, cycling, and rowing (yes, on the water) videos available for free so you can thoroughly test the app without a subscription. As with BitGym, you can mirror your screen to a television via AirPlay (again, no problems here) or HDMI and listen to your own music while the video plays. Videos can either be downloaded or streamed. Kinomap Fitness offers a number of features the other apps lack. First, it plays videos in either Discovery or Challenge mode. In Discovery mode, the video plays at the speed it was recorded — a 30-minute video will take exactly that long to play. In Challenge mode, the video’s frame rate changes based on your running speed, similar to BitGym. Another unique feature is the option to work out with other users. If you opt for single-player mode, you’ll be running, rowing, or riding against the “ghost” competitor who recorded the video. In open multiplayer mode, you can start or join a workout, and other users can enter or leave whenever they want. In private multiplayer mode, the workout is limited to people you know, and all the participants start at the same time. Kinomap Fitness also lets you compile a workout log and share results with others via email, Facebook, or other fitness-oriented apps and websites, such as Strava and RunKeeper. Happy Trails — Whether you’re a solo runner or have a burning desire to turn indoor training into a form of competition, one of these three apps should get you back on your exercise equipment and out in the great (virtual) outdoors. If cost is an issue, the $0.99 videos offered by Treadmill Trails are your best choice, although Treadmill Trails is by far the weakest app. For additional features and functional AirPlay support, either BitGym or Kinomap Fitness will meet your needs. And if you’re looking for social workouts or an app that will let you make the most of an interactive fitness machine, you’ll want Kinomap Fitness. 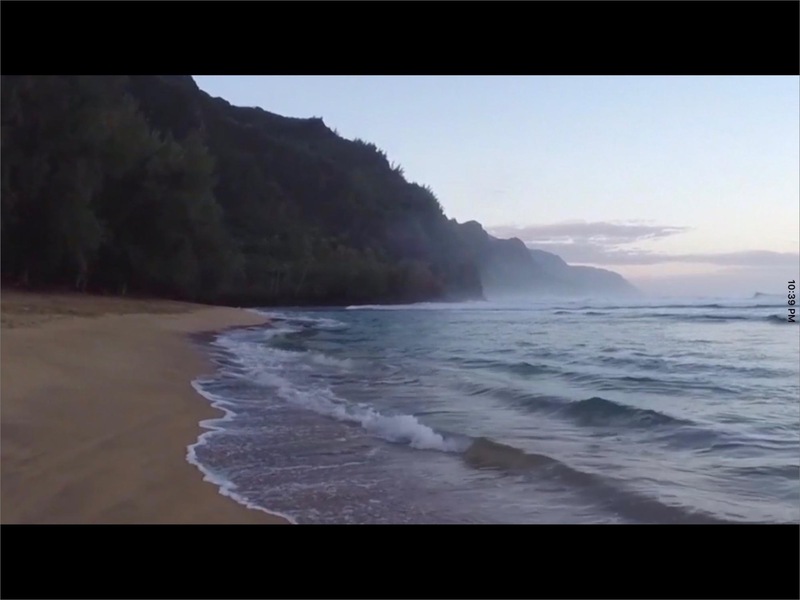 No matter which you choose, the scenery in the high-quality videos will easily beat the walls that surround you. Great article, but you missed one of the best: Zwift Originally made for cycling, they added support for treadmill running several months ago.